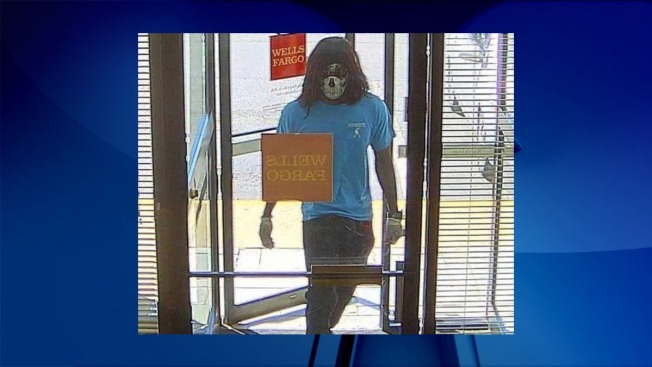 Police are searching for a masked man who robbed a Woodbridge bank Wednesday morning. Prince William County Police responded to a report of a bank robbery at Wells Fargo Bank on Dale Boulevard at 10:27 a.m. Monday morning. Employees told police a man entered the bank, passed a note to the teller and demanded money. He took an undisclosed amount of money and fled on foot toward Interstate 95. Witnesses saw no weapons, and no injuries were reported. The man is described as 5-feet-11-inches tall and 130 pounds. He was wearing a light blue shirt with white lettering, blue jeans, sneakers, sunglasses a mask and possibly a wig. If you know anything about this suspect or incident, contact Crime Solvers at 703-670-3700 or 1-866-411-TIPS. Anyone with information leading to an arrest could receive a reward of up to $1,000.